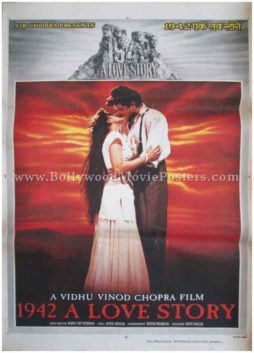 Classic Bollywood movie poster of the highly acclaimed Hindi film, 1942: A Love Story (1994) for sale. 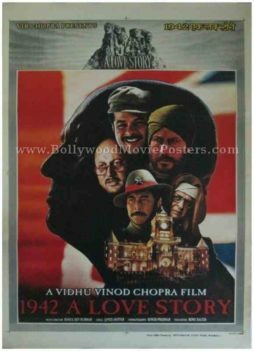 This is an actual surviving classic Bollywood film poster of the 1994 movie directed by Vidhu Vinod Chopra starring Anil Kapoor, Manisha Koirala, Jackie Shroff, Anupam Kher, Danny Denzongpa and Pran in pivotal roles. Printed and circulated during the original first release of the film (early 1990s), this classic Bollywood movie poster was originally designed for publicity of the film but never ended up being used. The award winning, timeless music of the film was composed by one of the greatest music directors in the history of Indian cinema, Rahul Dev Burman (RD Burman aka Pancham Da). 1942: A Love Story was released after the demise of master music composer RD Burman. He was awarded posthumously for his brilliant compositions in the film, winning his third and last Filmfare Award. 1942: A Love Story was the first Bollywood movie to use Dolby Sound and became a milestone in sound engineering, paving the way for use of the format in subsequent films. The film was also one of the first Bollywood films to be given a U/A rating as it featured a kissing scene, which was deemed by the censor board as inappropriate for young children. 1942: A Love Story is a landmark film in Indian cinema, making this classic Bollywood poster highly collectible! The period film was set in the year 1942, at a time when India was under British rule. The Union Jack in the background of this 1942: A Love Story poster gives away the era the film has been set in. A brilliant photographic collage of lead actors Anil Kapoor, Jackie Shroff, Anupam Kher, Danny Denzongpa and Pran is seen inside a silhouette like face.